CHARLOTTE AMALIE, St. Thomas, USVI -(St. Thomas source) With prayer, cultural music and pledges to improve the territory’s economic future, the 30th Legislature began its work on Monday January 14, 2013. Before a crowd made up of family, friends and the Virgin Islands government leadership, 15 senators rose to take the oath of office in Emancipation Garden as it was administered by V.I. Supreme Court Chief Justice Rhys S. Hodge. With some wiping away tears of joy and holding hands in unified prayer, the eight freshman senators and seven returning legislators were officially sworn in during a ceremony that included musical selections by Shikima Jones, Lorna Freeman and 11-year-old local singing sensation Brianna Campbell. Caught up in the celebratory atmosphere, new Senate President Shawn-Michael Malone and St. Croix Senator Alicia “Chucky” Hansen joined in with the St. Thomas Heritage Dancers in a traditional quadrille dance that brought smile and cheers from the audience. Mistress of ceremonies Dionne Pickering-Simmonds introduced government leaders seated on the bunting-covered dais that included Gov. John deJongh Jr., Lt. Gov. Gregory R. Francis, Delegate to Congress Donna Christensen, as well as a guest delegation from the British Virgin Islands that included Premier Dr. D. Orlando Smith. Pickering-Simmonds charged the new Senate class to be “perspicuous” in providing unquestionable transparency in all that they do. Family and friends immediately surrounded each senator at the conclusion of the hour-long event, posing for photos, exchanging hugs and, in the case of newly sworn-in Sen. Clarence Payne, joining in song with area grade school children. St. Thomas Sen. Tregenza Roach spoke to well-wishers of the high expectations placed upon his fellow senators by the people, and that he owed to them not to disappoint. Sens Judi Buckley and Clifford Graham both expressed their desire to get to work as soon as possible to address the territory’s economic concerns and said they have already met with stakeholders in their respective districts to gather more in-depth information. Following the morning’s outside festivities and a lengthy procession of dignitaries, it was all business across the street at the Legislative building beginning at 12:01 p.m. as Senate Vice President Samuel Sanes gaveled the Senate chambers, recognizing Democratic Majority leader Donald “Duck” Cole and his introduction of Resolution 30-0001. The motion calling for the approval of the newly formed majority, its officers and committee heads was called to a vote amidst objections from Sens. Buckley and Hansen. In a roll-call vote with only Sens. Nereida "Nellie" Rivera-O'Reilly, Buckley, Hansen and Roach voting against and Sen. Terrance “Positive” Nelson not participating, the motion was carried and the first bill of the 30th Legislative body was established. Malone was then officially passed the gavel of his new office as Senate president and proceeded to introduce each senator present, allowing them time to thank their guests who filled the chamber to capacity. In concluding the day’s first official Meeting of the Whole, Malone expressed his optimism for the future and challenged his fellow senators to hold fast to principles rooted in truthfulness, integrity, transparency and accountability. “I pledge to lead by example and to guide the body to undertake the vital reforms necessary to restore the public’s trust and confidence,” said Malone. 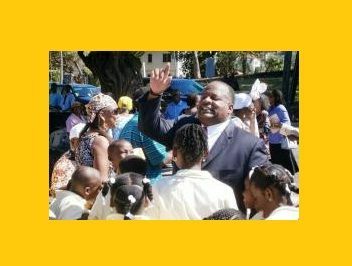 An ecumenical worship service in honor of the new Senate is scheduled for Wednesday in Frederiksted, St. Croix, at the Friedensberg Moravian Church at 10 A.M.
Everyone make it your right to VOTE on Elections Dayin the both virgin islands. Be the difference that makes for better change. Did now know she could still travel to rock city! how come they said she got arrested down there??? Good riddance the five of them should have stayed in st. Thomas!!! Why you all hate our leaders so much deman ??? You could have joined them and made it six...stupid comment..How many of them came up here to our celebrations? Six of them but I guess you woukld not have known that..stupid comment..